Italian Sparkling Wines, Prosecco, Metodo Classico and more. Italy was, not so many years ago, the top importer of French Champagnes. That's because the Italians are crazy for bubbles. Over the past few decades, though, Italian vintners have worked to meet the demand for sparkling wines in their own country and imports from France, while still substantial, have fallen. In the meantime, though, exports of Italian sparkling wines has risen dramatically. There are more than 2000 labels of Italian sparkling wine if we've correctly translated a statistical report issued in 2010. Lombardia, with its Franciacorta appellation, is a major producer of bottle-fermented sparkling wine. The Veneto, with its Prosecco fizzy, is an important region and Piemonte, with its array of Moscato bubblies, is also prominent in the arena of sparkling wines. Top Italian sparkling wines are made along the lines of France's Champagne: Pinot Noir, Chardonnay and Pinot Meunier form the foundation of top base wines. The wine is then fermented in the bottle and matured for some time period and aged on the spent yeast. 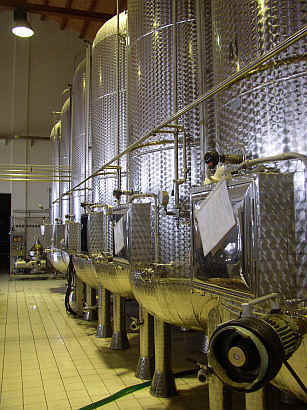 There are many wines, too, which have their secondary fermentation in tank and this is called the "Charmat" process. This is less costly and for aromatic varieties such as Moscato, it's probably the method which allows the grape to prominently shine in the glass. You might hear vintners speak of the Charmat process as the "Martinotti" or "Italian Method," though Charmat was a French fellow who's often credited with this regimen. Martinotti was a winemaker in the Asti area and his work pre-dates that of Monsieur Charmat by 15 years. Today the Franciacorta name is seen solely on sparkling wines, though years ago it was a denominazione for table wines, too. This Lombardian bubbly is based on Chardonnay and Pinot Nero, though Pinot Bianco may be employed in the base wine. The laws also require fairly low yields for the vineyards and these limits are significantly lower than those of France's Champagne region! 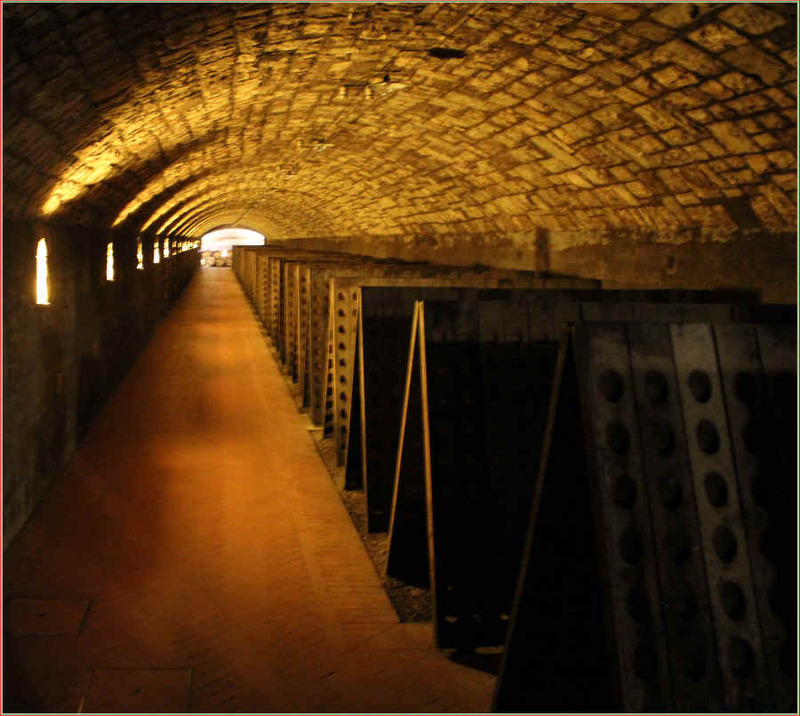 There are more than 90 wineries producing Franciacorta. 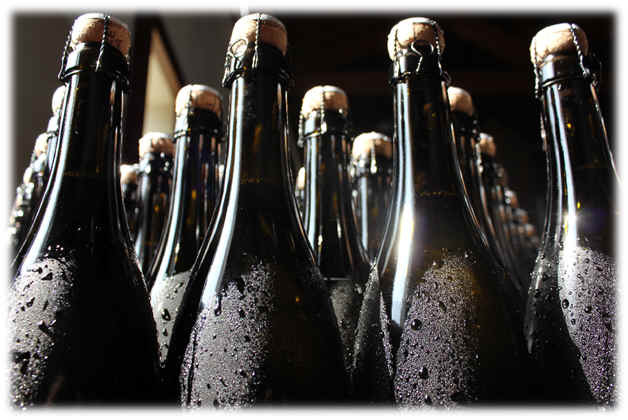 For basic Franciacorta, the bubbly must be aged for a minimum of 18 months on the yeast. Sat�n is made of Chardonnay and Pinot Bianco...24 month minimum on the yeast and it tends to be slightly less bubbly. Franciacorta Ros� must be at least 25% Pinot Nero, with Chardonnay and Pinot Bianco...24 month minimum aging period. 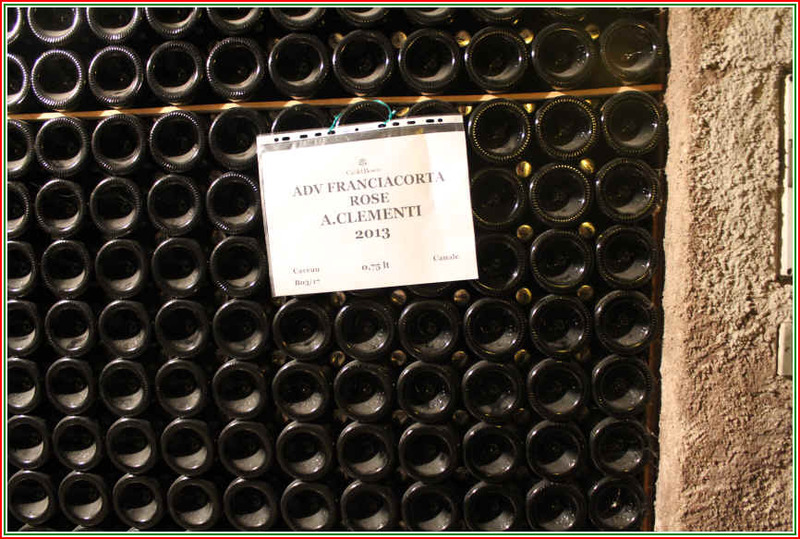 Franciacorta Millesimato is a vintage-dated wine with a 30 month minimum aging period on the spent yeast. Franciacorta Riserva bubblies need 60 months on the spent yeast and, yes, there can be Sat�n or Ros� wines bearing the Riserva designation. Trento or Trentodoc as they promote it today, has been a sparkling wine source since the early 1900s when Giulio Ferrari set up shop. Today there are 29 producers. The sparkling wine is made using Chardonnay, Pinot Noir, Pinot Meunier and/or Pinot Bianco. 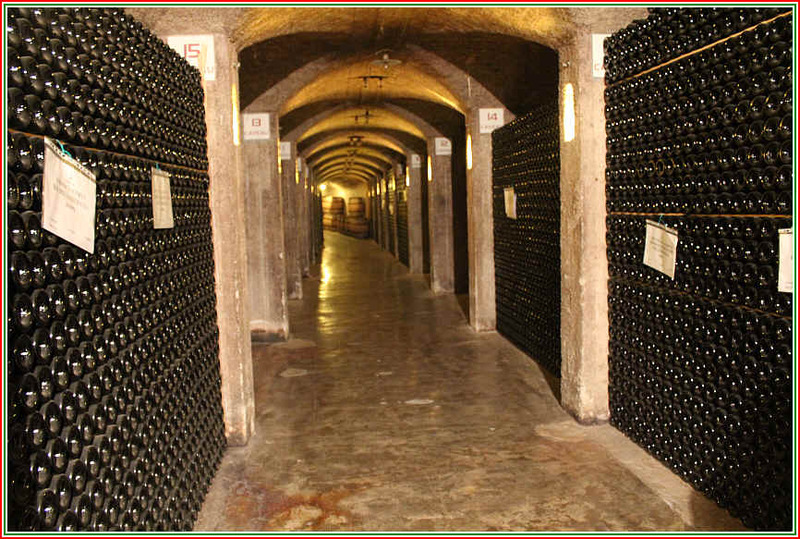 The wines must be aged at least 15 months for the non-vintage bottles, while vintage dated wines require a 24 month period of aging. Riserva wines need 36 months. ALTA LANGA This is a relatively recent denominazione and there are but a few producers presently. The wines must be bottle fermented and the base wines must be 90-100% of Pinot Nero and/or Chardonnay. The small percentage of "other" may be various grape varieties used for typical wines of the Langhe hills apart from Moscato. The can be made in white or rose form and the wines must be aged for 30 months, though the starting point is the harvest date. There are but 9 members of this group at the present time. ASTI SPUMANTE Moscato grown in the Cuneo, Asti and Alessandria areas is turned into this fruity fizz which enjoys immense popularity. This wine is fermented in what's called an "autoclave" where the secondary fermentation takes place in tanks and bottled, under pressure, retaining a fair bit of sugar. The less fizzy wines with the "Moscato d'Asti" designation tend to be much more aromatic and fine, but probably because smaller producers take more care. OLTREPO� PAVESE This is another wine from Lombardia in the area of Pavia. Juice from this region might find its way to producers in other areas. 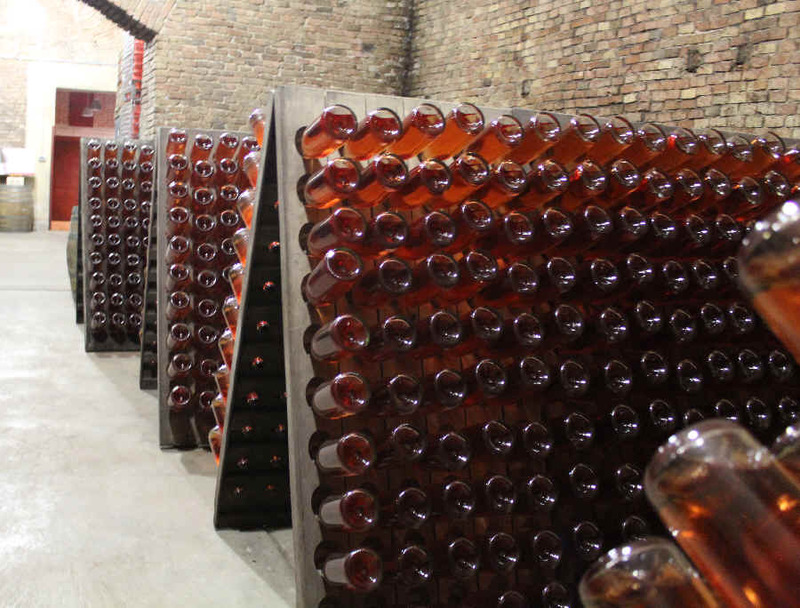 For Oltrepo Pavese "Metodo Classico," the wines must be, of course, fermented in the bottle. For the basic Metodo Classico or the "Oltrep� Pavese" metodo classico ros�, the wine must be at least 70% Pinot Nero. If the wine is labeled as either "Oltrep� Pavese" metodo classico Pinot nero or "Oltrep� Pavese" metodo classico Pinot nero ros�, the wine must be at least 85% Pinot Nero. The "other" portion of these wines must be Chardonnay, Pinot Bianco and/or Pinot Grigio. Non-vintage wines must spend at least 15 months on the yeast, while vintage-dated bottlings need at least 24 months of aging. The must be aged at least 18 months on the spent yeast and will be designated either as Brut or Brut Nature wines. There's quite a bit of Charmat process bubbly made there, too. They know this as the Martinotti method and 85% of the fizzy wine of this region is made using this process. Having seen the name of the grape "Prosecco" being used on wines from outside the main Veneto area of production, producers are working on a shift in branding. Now you'll see a big push to market the names Conegliano-Valdobbiadene as being "the" region for Prosecco. And it is "the" region, but such a shift may take a while. In their effort to "help" make this transition, producers of Prosecco will now tell you their wine is made predominantly from the Glera grape. Wines with the Conegliano-Valdobbiadene designation must be, then, 85% of what was yesterday called Prosecco and today, "Glera." The remaining 15% can be local varieties such as Verdiso, Boschera and Bianchetta, though many are blended with Chardonnay and/or Pinot Bianco. In the Conegliano-Valdobbiadene region, they don't give the Piemontese fellow, Martinotti, credit for his "bulk process" for making bubbly. Nope. Here it's called the "Italian Method" and here it's Antonio Carpen� who's credited with the bulk process of making sparkling wine. These fizzies must spend all of 30 days in tank before being bottled. You'll find them predominantly in Extra Dry format, partly because the Prosecco or Glera grape tends to have a slightly bitter aspect. Leaving a touch of sweetness balances the wine. Even so, a few vintners make a more dry "Brut" sparkling wine and those labeled "Dry" are anything buy. 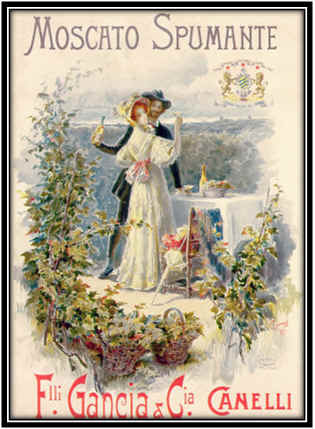 Prosecco used to be more popular in its "frizzante" format, though these days "spumante" wines are more easily found. A couple of special designations are offered. 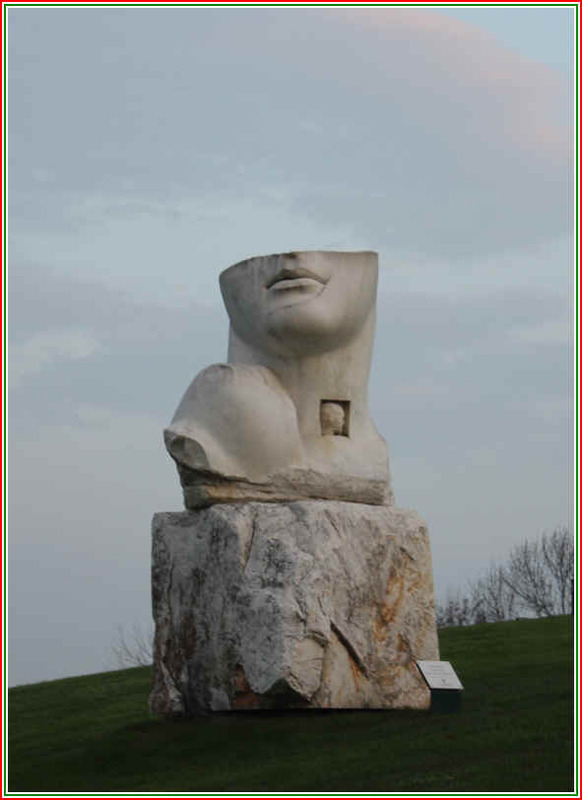 One is called "Cartizze" or Superiore di Cartizze and this is a small area of about 106 hectares in the Valdobbiadene region. Most of the bubblies of this designation tend to be a bit sweet, though a few producers are making "Brut" sparklers. "Il Rive" is another sparkler...a small area of a single site of hillside vines with reduced yields in the vineyard being mandatory. The wine must be from hand-harvested grapes and it's supposed to have the vintage noted on the label. So, Cartizze is viewed as the top quality wine, whilst Conegliano-Valdobbiadene wines will carry the "Prosecco Superiore" designation. Colli Asolani Prosecco, or Asolo Prosecco Superiore is next on the pecking order with wines labeled simply as Prosecco being viewed as more modest in quality. OTHER PIEMONTESE BUBBLIES Piemonte has a number of bubblies apart from the Asti Spumante and Alta Langhe wines. You might find a Gavi wine made into Spumante and near Torino you might find some Erbaluce di Caluso Spumante. There's a tiny production of Roero Arneis done as Spumante. Well off the beaten path is a red fizzy called Colline Saluzzesi Quagliano Spumante... very esoteric. Freisa is a grape making robust and tannic red in a few instances, but usually it's a fizzy, simple red and sometimes done as Spumante. Malvasia is produced as a frizzante wine and periodically as full-throttle spumante. And Nebbiolo d'Alba is still permitted as a Spumante and it might be produced either as a 'white' or rose' wine. There is a tiny production of Pelaverga from Verduno done as a Spumante! Brachetto d'Acqui is another fizzy Piemontese wine, a red bubbly that's usually a bit sweet. VENETO In the Veneto, you might run across a Recioto di Soave that's fizzy. In Verona & Vicenza, there's an obscure bubbly called "Arcole" and it's at least 50% Garganega, the grape of Soave. The rest can be Pinot Grigio, Pinot Bianco with Sauvignon and/or Chardonnay. Sometimes these are sweet, but typically they're dry. Ever hear of Bagnoli di Sopra Spumante? This is made around Padova with the red Raboso grape, which might be augmented with up to 20% of Chardonnay, while pink versions might have as much as 40% of Merlot. Who knew? You might find someone making a Bardolino as a pink Spumante. Bianco di Custoza also allows for a bubbly incarnation. 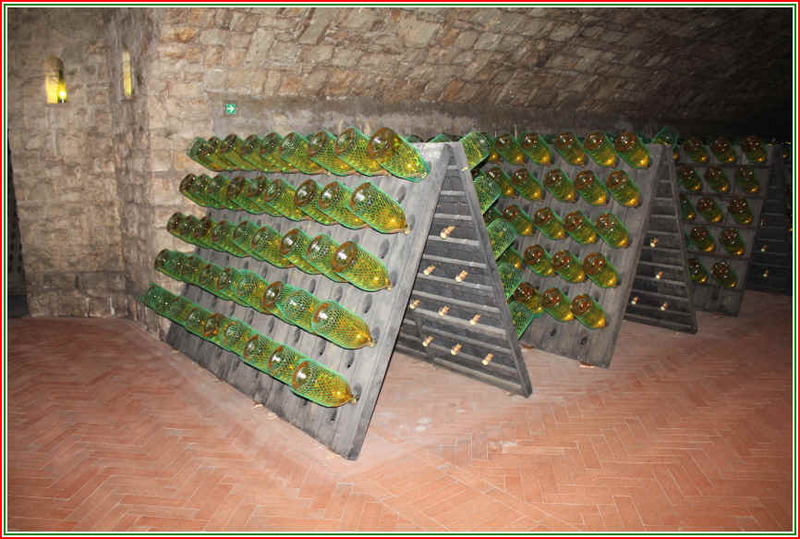 The Colli Euganei produces some sparkling wines...we have a dynamite Fior d'Arancio (Orange Muscat) made as a Spumante. Lessini Durello comes from Verona & Vicenza and is made entirely of Durello, while around the Gambellara hills, you can find a bubbly made of dried Garganega grapes called Recioto di Gambellara Spumante Dolce. Garda has some bubblies and so does the Lison-Pramaggiore areas. There's also a Lambrusco Mantovano made near Emilia-Romagna...usually a dry wine. ALTO ADIGE & TRENTINO Both regions make sparkling wines. In the Alto Adige they'll likely be made from Chardonnay, Pinot Nero and/or Pinot Bianco. In the Trentino, bubblies are often vinified from Pinot Noir, Chardonnay, Pinot Bianco and/or Pinot Meunier. The famous Ferrari winery makes Italy's benchmark Spumante called Riserva del Fondatore, a wine which is in a class by itself in our view. There's also the Colline Marconiane and the Terra di Montebudello where the Pignoletto grape (which might be what the Umbrians call Grechetto) is made as a Spumante. The Colli di Parma makes fizzy and Spumante wines, often from Malvasia (as both sweet and dry), but there's dry bubbly made of Sauvignon there, too. The Colli di Scandiano e di Canossa regions make a Spumante from a grape called Spergola which was once thought to be some sort of Sauvignon. Today they say "No, it's its own variety." The same area produces some Lambrusco wines. The Colli Piacentini produces some Spumante...ever heard of Valnure? It's not a grape but a blend of Malvasia di Candia aromatica, Ortrugo and Trebbiano romagnolo. A similar blend appears under the "Monterosso Val d'Arda" appellation. Colli Piacentini also makes spumante wines from Bonarda, Chardonnay, Malvasia, Pinot Grigio, Pinot Nero and Trebbianino grapes. Of course there's lots of Lambrusco. Lambrusco Grasparossa di Castelvetro comes from near Modena...often full-bodied and slightly bitter/tannic. Lambrusco Reggiano features all four clones of Lambrusco and it's a huge region, so then Italians can't drink it all themselves. From just outside the town of Sorbara comes the Lambrusco Salamino di Santa Croce and this tends to be a bit lighter in color and body. The Lambrusco di Sorbara is typically a blend of Sobara and Salamino clones. It's usually the most highly-regarded, too. The Trebbiano di Romagna denominazione can be found as a Spumante, too. TOSCANA Tuscany is not presently producing much in the way of bubblies. Bianco di Pitigliano has a Spumante version. This comes from near Grosetto out on the coast and it's mostly made of Trebbiano Toscano. Out on the island of Elba there's a Bianco Spumante which is made of Trebbiano Toscano with Ansonica and/or Vermentino. The Valdichiana near Arezzo has a Bianco (or Bianco Vergine) designation which may be Spumante. This needs at least 20% Trebbiano Toscano with an 80% maximum of the following in an "and/or" role: Chardonnay, Grechetto, Pinot Bianco and/or Pinot Grigio. LE MARCHE In the Marche, you might find a rare red bubbly called Vernaccia di Serrapetrona. This is produced both as a dry and sweet sparkling wine. Another couple of oddballs come from the Colli Maceratesi (south of Ancona). The Colli Maceratesi Bianco must be made with at least 70% Maceratino (some say it's related to Greco, while others have this as a Verdicchio clone) along with Incrocio Bruni (a cross of Sauvignon and Verdicchio). There's also Colli Maceratesi Ribona Spumante, a wine made of at least 85% Maceratino (which can be called Ribona or, to keep us guessing, Montecchiese). 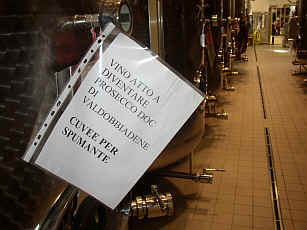 Also in the area is the San Ginesio appellation and here you might San Ginesio Spumante in either dry or sweet formats. Vernaccia Nera is the main grape. The Offida denominazione allows for the production of an Offida Passerina Spumante. The famous Verdicchio di Castelli di Jesi, as well as the Verdicchio di Matelica have Spumante versions. UMBRIA The Colli di Trasimeno produces a Spumante which is predominantly Chardonnay and allows for blending Pinot Nero, Pinot Bianco, Pinot Grigio and/or Grechetto. 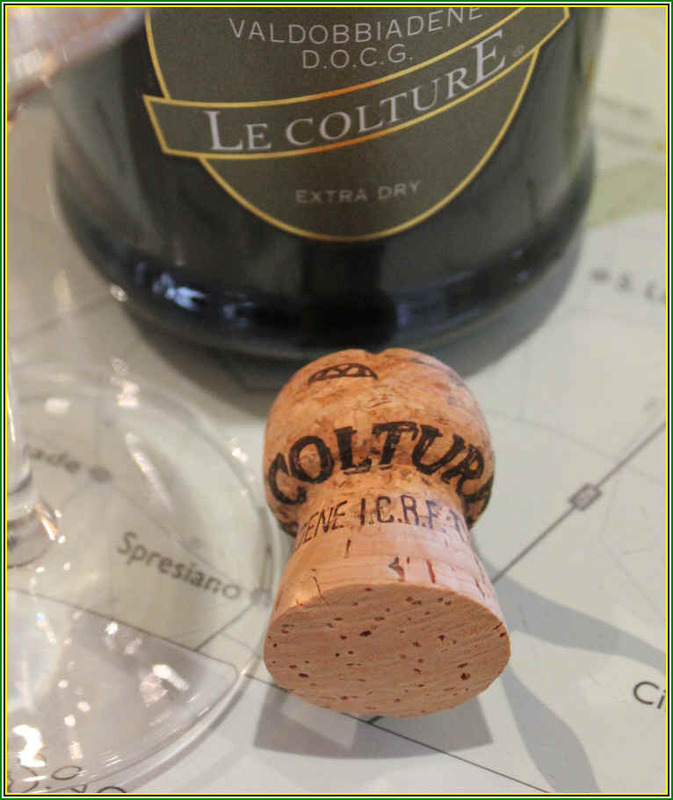 The Colli Perugini denominazione Spumante is predominantly Grechetto with small amounts of Chardonnay, Pinot Nero, Pinot Bianco and/or Pinot Grigio being allowed. Torgiano Spumante limits Chardonnay to 50% and Pinot Nero to 50%, which pretty much gives you the recipe for that type of sparkling wine. We did taste an Umbrian sparkler which was purportedly made of the rather tannic Sagrantino grape, vinified as a white wine. LAZIO Lazio produces a lot of frizzante wines and a modest quantity of Spumante. The red Cesanese grape produces a Spumante called Cesanese di Olevano Romano. Colii Albani Spumante is limited to 60% Malvasia di Candia with a variety of Trebbiano clones being allowed for the rest of the blend. Colli della Sabina Spumante comes in both red or white. The latter is Trebbiano Toscano or Trebbiano Giallo and Malvasia, either del Lazio or di Candia. The red is mostly Sangiovese with Montelpulciano. The famous Est! Est!! Est!!! di Montefiascone can be made as a Spumante providing it's 65% Trebbiano Toscano (also known as Procanico) with 20% Malvasia bianca Toscana and 15% Rossetto, which is Trebbiano giallo to some winemakers. Frascati Spumante features two Malvasia varieties and Trebbiano Toscano, possibly including some other grapes. Marino Spuamnte is a somewhat similar blend. Vignanello Spumante is made of the Greco grape, which is probably noted on the label. CAMPANIA Greco di Tufo Spumante may be blended with as much as 15% of Coda di Volpe Bianca. Aspirino di Aversa Spumante must be made entirely of Aspirino, which might give some local winemakers a headache in not being able to blend in something else. Campi Flegrei Falanghina Spumante comes from the Amalfi Coast. You might also encounter a Castel San Lorenzo Moscato Spumante which comes from the Salerno area. The Benevento area has a sparkling wine made of Falanghina and it's called Guardiolo Spumante. Sannio is another Benevento province sub-region and they can make sparkling wine from just about every grape variety: Coda di Volpe, Falanghina, Fiano and Moscato amongst the white grapes. Red grapes employed for Sannio sparkling wines might include: Aglianico, Barbera, Piedirosso and the obscure variety known as Sciascinoso. If you see a wine labeled simply as Sannio Spumante Metodo Classico, this is probably based on Aglianico with a bit of Greco and/or Falanghina. Also in the neighborhood is the Solopaca denominazione and the Spumante with that name on it is based upon Falanghina. Taburno Spumante is made of Coda di Volpe and/or Falanghina typically. The Irpinia area also has a Falanghina Spumante and even the possibility of making sparkling wine from Aglianico. Out on the island of Ischia you might run into Ischia Bianco Spumante which is typically a blend of Forastera and Biancolella. Vesuvio produces the wines labeled as Lacryma Christi del Vesuvio in white, pink and red and each can be made as a Spumante. The white would be made mostly of Coda di Volpe, while Piedirosso accounts for most of the red. PUGLIA You can't get much farther away from France's Champagne region than this southern outpost in Italy's boot 'heel'. Yet there are several sparkling wines made in this region. Gravina Spumante is made of Malvasia del Chianti and Greco di Tufo and/or Bianco d'Alessano, but possibly Trebbiano Toscano and/or Bombino bianco and/or Verdeca. Lizzano Rosato Spumante is usually based on Negroamaro with Montepulciano, Sangiovese, Pinot Nero and/or Bombino Nero and maybe Malvasia Nera. Locorotondo Spumante would be a virtually similar blend to Martina Spumante: Verdeca with Bianco d'Alessano and possibly Fiano, Bombino Bianco and a drop of Malvasia Toscana. Salice Salentino can be a Pinot Bianco Spumante or a Rosato Spumante, the latter being based upon the Negroamaro grape. A San Severo Spumante Bianco is Bombino Bianco and Trebbiano Toscano with small amounts, possibly, of Malvasia Bianca and/or Verdeca. BASILICATA You might not expect to find bubbly in this little outpost, given the fame of its Aglianico del Vulture red wine. But a vintner there can produce an Aglianico del Vulture Spumante which must be 100% varietal. There's one other DOC bubbly in Basilicata and that's a Matera Spumante, made primarily of Malvasia Bianca di Basilicata with a small amount of Greco in the blend. SICILIA Alcamo Spumante comes from a region west of Palermo and east of Trapani. A white bubbly would be made of Catarratto primarily. The Rosato version would be most Nerello Mascalese with any of these odds & ends: Calabrese, Nero d'Avola, Sangiovese, Frappato, Perricone, Cabernet Sauvignon, Merlot and/or Syrah. In the middle of Sicily, southeast of Palermo and northeast of Agrigento is the Contea di Sclafani denominazione. The basic Spumante is likely to be mostly Catarratto with possibly Inzolia and/or Grecanico. That appellation also may have varietal bubblies, including wines made of Grillo, Ansonica (or Inzolia, if you prefer), Catarratto, Chardonnay, Grecanico, Pinot Bianco or Sauvignon. A Rosato Spumante is usually at least half Nerello Mascalese. Delia Nivolelli is not the name of an Italian movie actress, but a wine DOC from the Trapani area. Spumante there are based on Grecanico and/or Inzolia, but might also include Damaschino (usually found in Marsala wines) and some weird grape known as Chardonnay. The Erice Spumante comes from a small area just east of Trapani and this must be made predominantly of Chardonnay! Moscato di Noto Spumante comes from the southeast corner of Sicily and it's made of Moscato, as you probably guessed. Pantelleria Moscato Spumante comes from the island south west of Sicilia in the Mediterranean Sea. There the Moscato is known as Zibibbo. 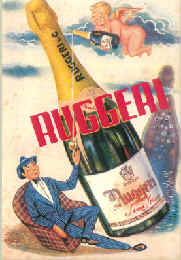 Riesi Spumante comes from well east of Agrigento and north of Vittoria. It may be entirely (or predominantly) Ansonica. SARDEGNA The Alghero region in northwest Sardegna can make a white Spumante of various varieties, including Chardonnay, Vermentino, Torbato and Sauvignon. 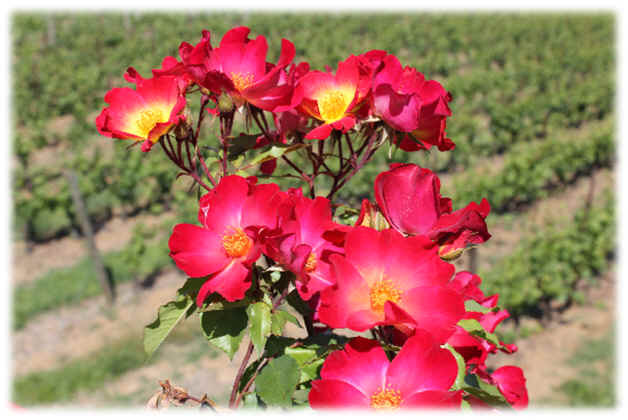 The Rosato is perhaps Cagnulari, Cabernet, Carmenere or Sangiovese. There's another obscure grape on this island called Semidano and this white variety was nearly extinct, but seems to be catching some vintner's attention. It's a rarity, though, as a Sardegna Semidano Spumante. Vermentino di Sardegna Spumante is made, as you might expect, mostly of Vermentino. In the Valle d'Aosta there's some nice bubbly made in Morgex of the Pri� Blanc grape. These have the name of Blanc de Morgex et de La Salle Spumante. Lombardia, in addition to its Franciacorta and Oltrepo bubblies, has a small production of Lugana Spumante. Friuli produces some lovely sparklers. These are modeled along the lines of Champagne, with Chardonnay and Pinot Nero leading the way. Our friends at Dorigo make a good bubbly. In the peaceful hills of Teramo in the Abruzzo region, you might find a Spumante with the Controguerra denominazione. It's a blend of Trebbiano Giallo and Passerina. Molise has some varietal Spumante, including Chardonnay, Moscato and Pinot Bianco. If you're looking for a DOC Spumante from Calabria, you're probably out of luck. See that bottle to the left? That's one of the world's finest sparkling wines. It's a remarkable wine that is actually worthy of the phrase "in a class by itself." Italy, as you may have read in the table above this posting, makes oodles of sparkling wines. Oodles, by the way, is technical nomenclature. As fans of great Champagnes, we're always interested to see what producers of bottle-fermented bubblies are making. 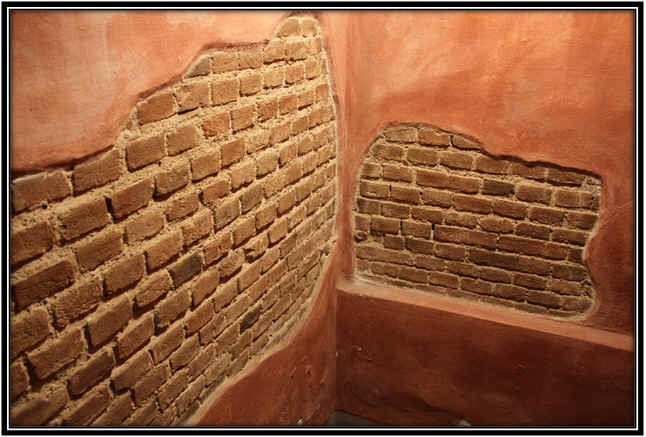 Some Cavas from Spain are of good quality. France makes some nice bubblies apart from Champagne. Germany and Austria have some serious-minded producers, too. A few California wineries are making some fairly deluxe sparkling wines. In Italy, though, there are some pretenders, such as Ca' del Bosco, the Cakebread or Far Niente of Lombardia in our view. And we've tasted some really good Piemontese sparkling wines and a few from Friuli. But none, frankly, is comparable to the "Riserva del Fondatore" bottling from Ferrari which bears the name of the founder of the winery, Giulio Ferrari. His home town of Trento was part of Austria in those days and Giulio Ferrari first studied vines and wine in Germany's wine school in Geisenheim. He also attended the French viticulture school in Montpellier as well as working for in France's Champagne region before returning home in the late 1800s. One important item he picked up along the way was a curious grape called Chardonnay. Of course, he'd learned of this important variety in Champagne, but it simply was not grown at that time in the Trento region. In reading about Ferrari, it seems he was even more passionate about grape growing than he was about winemaking. And he understood his job of winemaking would be easier if he had good raw material, grapes. Ferrari, though, had the idea that he could replicate the sparkling wines from Champagne after working in cellars in Reims and later in Epernay. He started a fabbrica di Champagne and is said to be the "padre della spumantistica italiana" even though Gancia and Carpene preceded him by 4 decades in making sparkling wines. It seems Ferrari's initial interest, though, was for viticulture and he had a nursery in nearby Friuli. The production of sparkling wine began as a side interest or hobby and he began making just a couple of thousand bottles. It was called "Grand Cr�mant Imp�rial Maximum Sec G. Ferrari & C.ie," so he even paid tribute to the Champenoise by giving the wine a rather French-sounding name. Half a century after launching his first vintage of sparkling wine Giulio was still making his famous bubbly. But he had no family to take over the winery and he ended up selling the business to a local wine geek and customer, Bruno Lunelli. Lunelli owned the town of Trento's most esteemed wine bar and in the 1950s he found himself with vineyards and a winery to operate. Now he was really in the wine business! Ferrari stayed on to work at the winery and he made appearances in the cellar practically up until the time he died in the mid-1960s! Bruno Lunelli's sons then ran the winery...Gino, Franco and Mauro. Mauro was a winemaker and aided by his nephew Marcello, the two conspired to produce the first bottles of what has become the grand "Riserva del Fondatore" spumante. With the 1972 vintage Mauro and Marcello hid a couple of thousand bottles of bubbly to see what might happen with extended aging en tirage. They selected Chardonnay from the best vineyard in the highest site to make the base wine and they squirreled away the bubbly. Then, having followed the wine over the years, they organized a tasting of this special wine for the rest of the family. And so, the benchmark Italian sparkling wine, "Giulio Ferrari" was born. We currently have some bottles of the 1999 vintage. It's a grand sparkling wine, elegant, fine and very dry. There's a toasty element one finds in top, well-aged French Champagnes. But you'll come across notes of white flowers, apple-like fruit and a minerality like you're licking a stone. The 2001 is similarly styled, very fine and with a grand bouquet of toasty, yeasty notes and green apple fruit. The Lunelli family makes a really nice, solid, reliable entry-level bubbly of good quality. It's entirely Chardonnay from hand-harvested vineyards situated in the Val d'Adige, Val di Cembra and the Valle dei Laghi. The juice is fermented in stainless steel and then put in the bottle for its secondary fermentation. They typically leave the bubbly for about two years on the yeast, so it has a nicely mild biscuity fragrance. The dosage is low, too, so the wine is dry and nicely balanced. The pink format, Ros�, is 60% Pinot Noir and 40% Chardonnay. This wine is matured for 24-30 months on the yeast and it's one of our favorite values in good, dry pink bubbly. The Franciacorta region is often described as the premier location in Italy for sparkling wines. It's about an hour by car from Milano and you'll be driving towards Verona and Venice. At one time the Franciacorta designation was on all the wines from this region in Lombardia, but these days it's used solely for the bottle-fermented sparkling wines. Today there are maybe 110, or so, wineries making Franciacorta. Most make competent sparkling wine. 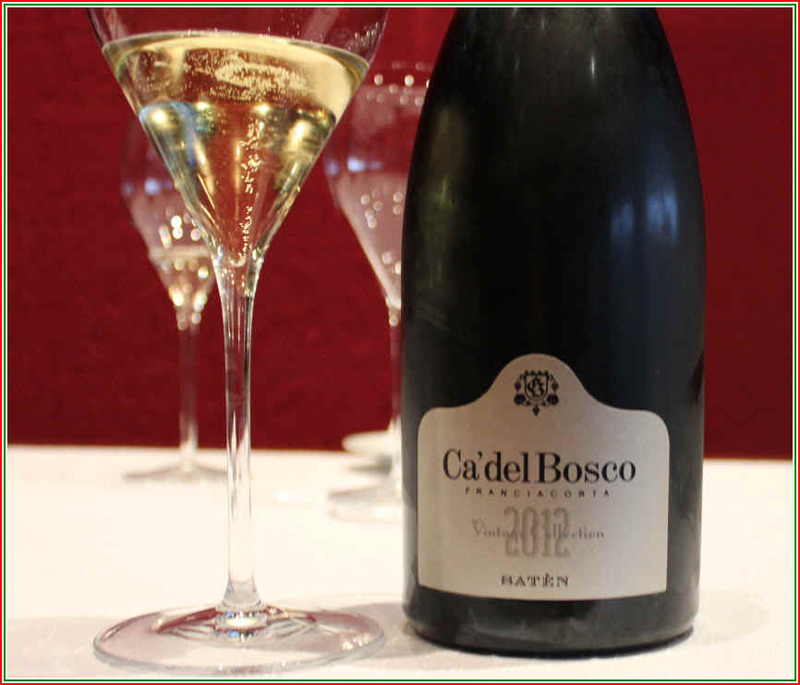 If you use Champagne...good Champagne...as a benchmark for bubbly, then Ca' Del Bosco is the Franciacorta for you. 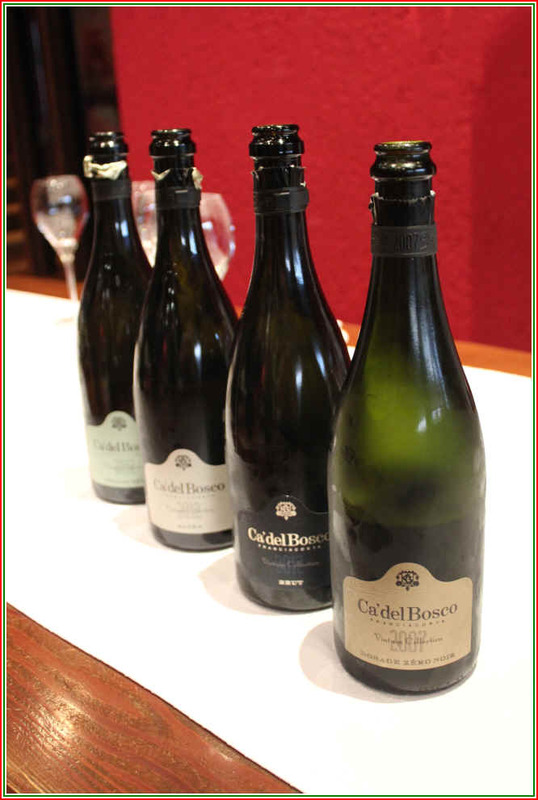 We have said that there is Ca' del Bosco and then there are the rest. It's not that the others don't make typical Franciacorta sparkling wines, it's simply the quality and character of the Ca' del Bosco wines are in a class by themselves. The winery also produces some table wines, so you can explore their efforts with Chardonnay, Pinot Noir and a Bordeaux-styled blend. We first became aware of Ca' del Bosco in the mid-to-late 1980s. At the VinItaly wine fair we had stopped at the winery's stand and tasted some extraordinary wines. They had an American winemaker (who today is a prominent wine importer), Brian Larkey. The winery owner is Maurizio Zanella, a flamboyant fellow and tireless promoter. The wines were mind-boggling. The estate was purchased as a get-away property back in the 1960s. Zanella's father was in the shipping business and his Mom wanted a place out of the big city as a weekend retreat of sorts. Maurizio was not much interested in school, but was a fan of motorcycles. He somehow was able to register for a trip to France with local wine growers and there were stops in various wine regions on the way to Paris. It was a stop at the Domaine de la Roman�e-Conti that resonated with Zanella. The wines were, of course, fantastic. He paid attention to their vineyards, which he noted were densely planted. 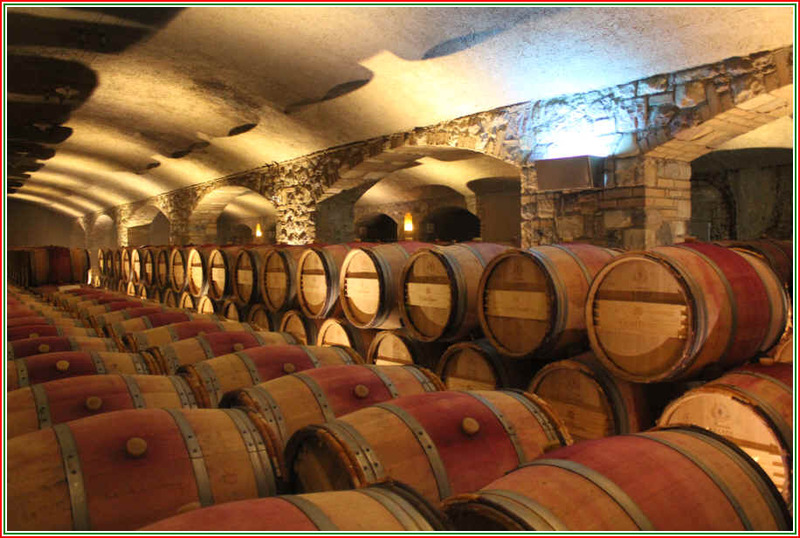 The cellar featured new oak barrels and these were much smaller than the large wood vats typically used in Italian winemaking. When he returned home from this trip he convinced his parents about his new dreams of having vineyards and making wines. Though there may have been some vines on the property, it was in 1968 they began planting new vineyards. In 1972 they vinified the first Ca' del Bosco wine, a Pinot Bianco. In 1975 Zanella saw the birth of his first red wine and the following year he embarked on his sparkling wine adventure. After fits and starts with the sparkling wines, Zanella invited the chef de cave from Mo�t & Chandon to visit and give him some guidance. Andre Dubois was not conversant in Italian, though, but he did speak "Champagne" and helped guide the fledgling Ca' del Bosco to making better sparkling wine. 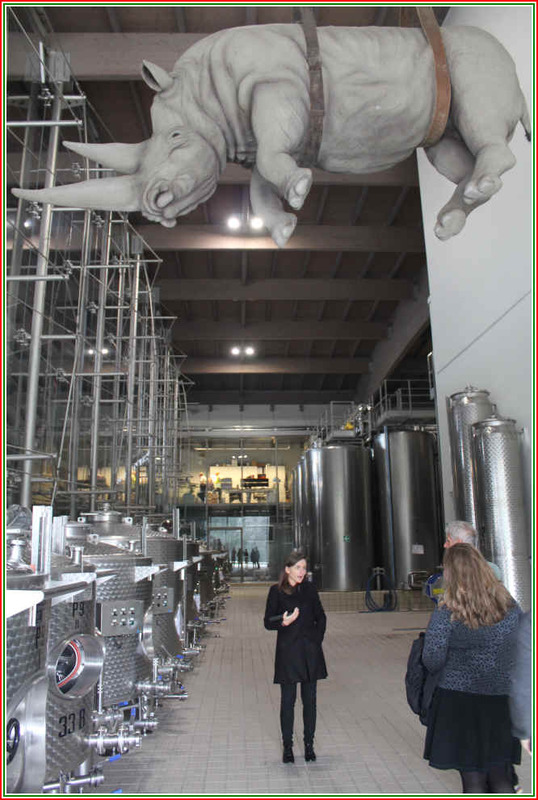 The expense involved in producing and promoting the wines was enormous and so today Zanella has a partner in this enterprise, Zignago Holding. This is a multi-faceted company owned by the Marzotto family. They own the Santa Margherita winery, as well as some bottle & glass factories, power companies and finance groups. 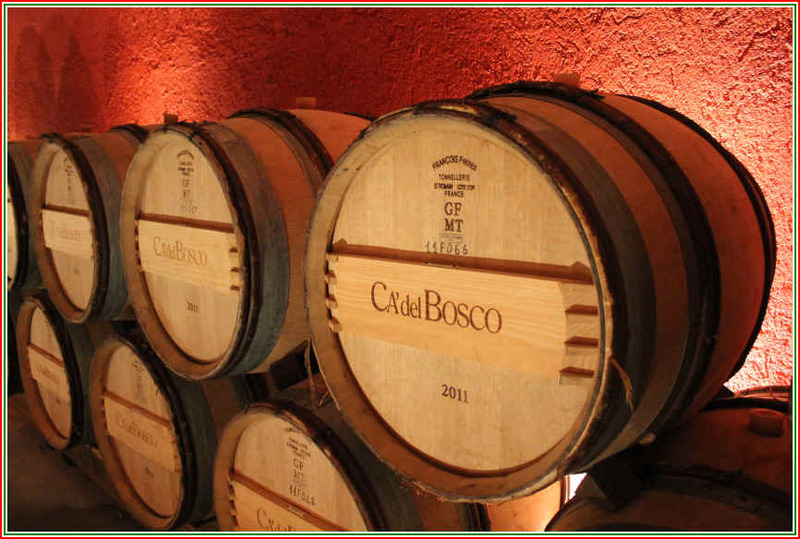 Today Ca' del Bosco has plenty of resources for making its deluxe-quality wines. These days there are 8 sparkling wines being made and 7 table wines. The winery is a blend of modern technology and art. 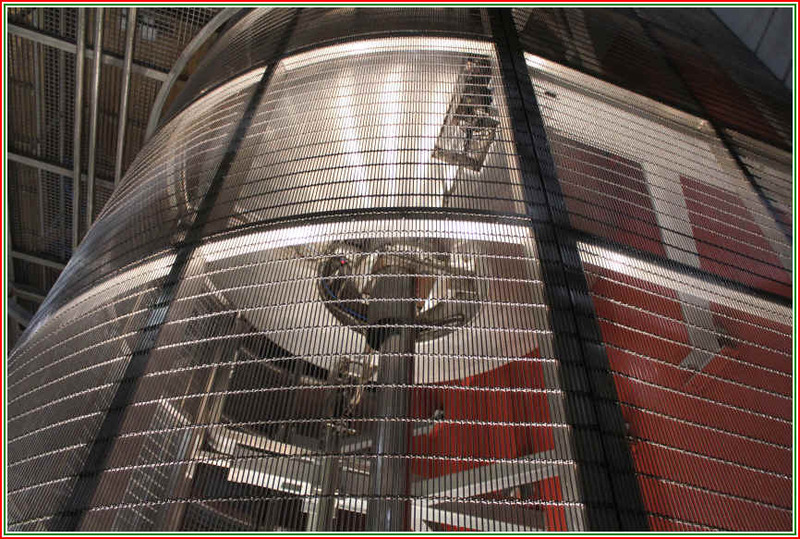 This special tank can be elevated to allow for gravity-flow racking. As mentioned earlier, they do make a number of "still" wines. 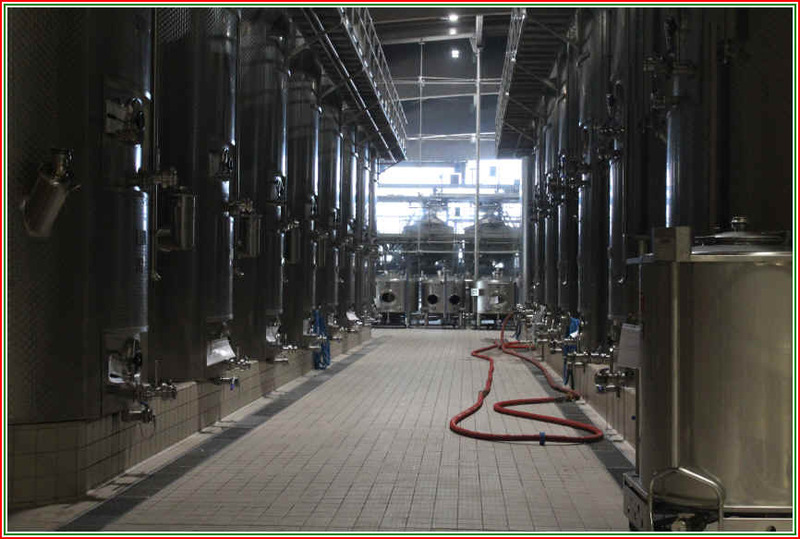 And you can see cellars full of bottles of sparkling wine, Franciacorta, maturing on the spent yeast. 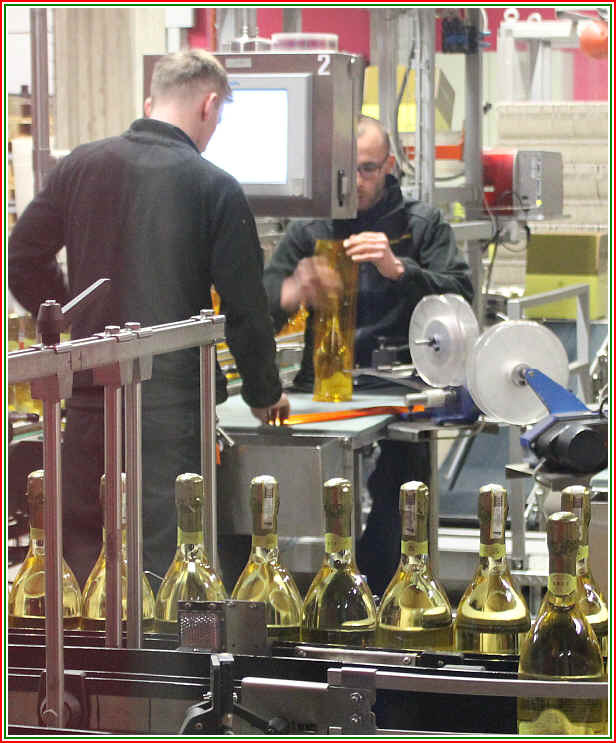 Magnums are on riddling racks. And there are plenty of riddling racks waiting for more bottles. These racks are empty as the disgorging line was fully operational on the day we visited. The bottles are wrapped in cellophane, apparently to protect the wine in the clear glass, from UV rays. As of 2018 Ca' del Bosco has 2019 hectares of vineyards. They are dedicated to organic farming and these vines are certified, too. 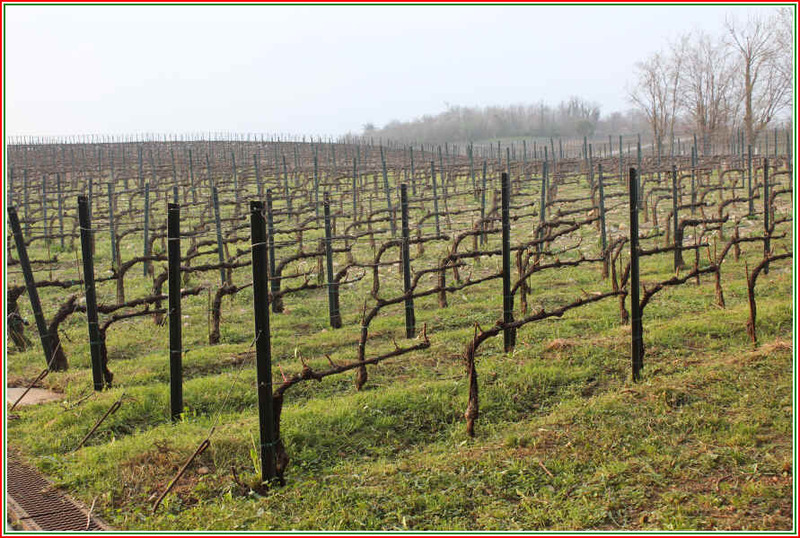 You might notice these vines have been pruned with the idea of quality, rather than quantity, in mind. 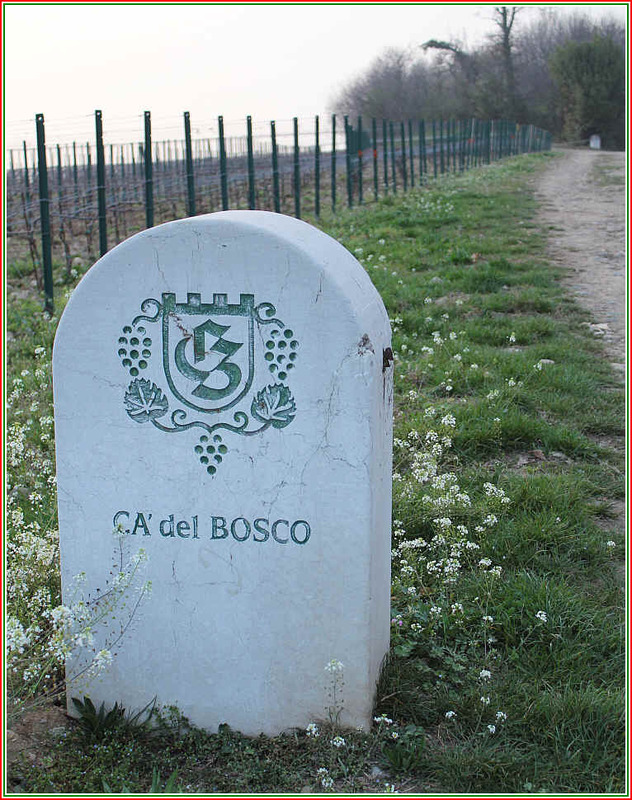 The winery describes its various protocols as "The Ca' del Bosco Method." They speak about respecting tradition, but they indicate that this does not mean they strive to improve, not willing to rest of their laurels. Zanella says they want to connect the past with the present. "Today we risk a needless contrast between �modernists� and �traditionalists�; an ideological dispute that ends up justifying, perhaps in the name of naturalness, wines with shortcomings, or in any case disappointing. There are no shortcuts in the world of wine. The naturalness of a product is no excuse for eliminating clarifications or extolling the supposed virtues of local yeasts." They do some experimentations each vintage in an effort to improve quality. In 2008 the winery purchased a machine they call a "Grape Spa." Some friends in Italy's Trentino region came up with this idea and we were skeptical. But both they and Ca' del Bosco make the claim this machinery produces wine of higher quality. The fruit, after being sorted at the winery door, then goes into this device which has three soaking vats. "The benefits of our grape Spa are many. It almost totally eliminates residue from pesticides, hydrocarbons, mold, dust, dirt and any insects that may still be present. It makes the must more hygienic. It facilitates the fermentation of the yeasts, so there are no stunted aromas as, no suppressed nuances. Finally, it increases its hedonistic nature. Starting today, our wines are more attractive. More enjoyable. Easier to digest. And, thanks to technology, more natural." 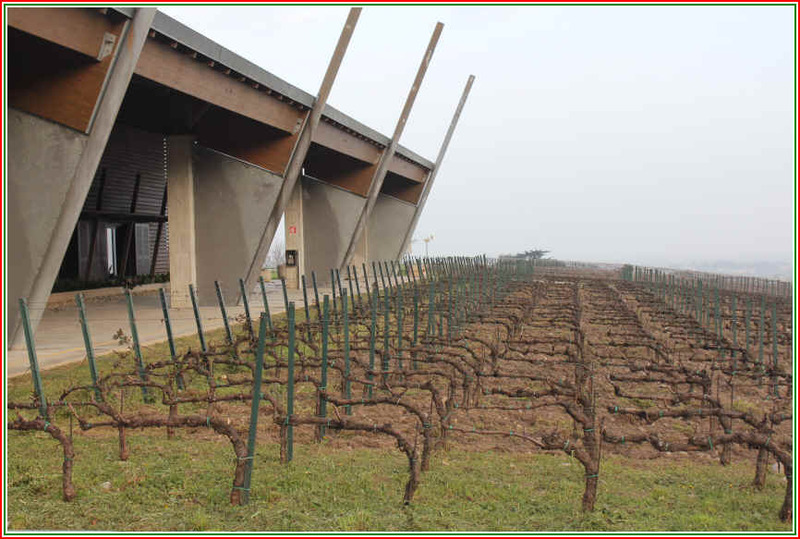 Zanella contends they also use less sulfur in their wines, in part, thanks to this grape "spa." The bottom line is, whatever they are doing, the end results speak volumes. We are big fans of the entry-level Cuv�e Prestige, a bubbly that's 75% Chardonnay, 15% Pinot Bianco and 10% Pinot Nero. The juice is fermented in stainless steel tanks and the wine remains in those vessels for about 7 months until the wine clarifies on its own. Then they assemble the base wine blend by incorporating 20% to 30% of aged, "reserve" wine. Once the wine goes into bottle for its secondary fermentation, it remains there for about 2 years. They have a special machine for the disgorging process which avoids introducing oxygen into the bottle (and the need for the addition of sulfites to preserve the wine). The dosage is small and the wine has maybe 4 grams per liter of residual sugar. Most people don't detect sugar until there are 5 grams/liter in a wine. We like the toasty notes and the "purity" of the fruit and yeasty elements of the Cuv�e Prestige. With our sale pricing, the wine competes quite nicely alongside French Champagnes. There's a special bottling to honor Zanella's mother, Anna Maria Clementi. It's their "top of the line" bottling and usually features about half Chardonnay, a quarter fraction of Pinot Bianco and the rest being Pinot Nero. The must is barrel fermented and it undergoes a full malolactic fermentation before they put it in bottle for its sparkling wine fermentation. This is usually matured for 8 or 9 years before it's disgorged. There is no sweetening dosage and the wine is stone, bone dry. It is the only Italian sparkling wine we find to be a worthy challenger to Ferrari's Riserva del Fondatore. It is a seriously fine bubbly. 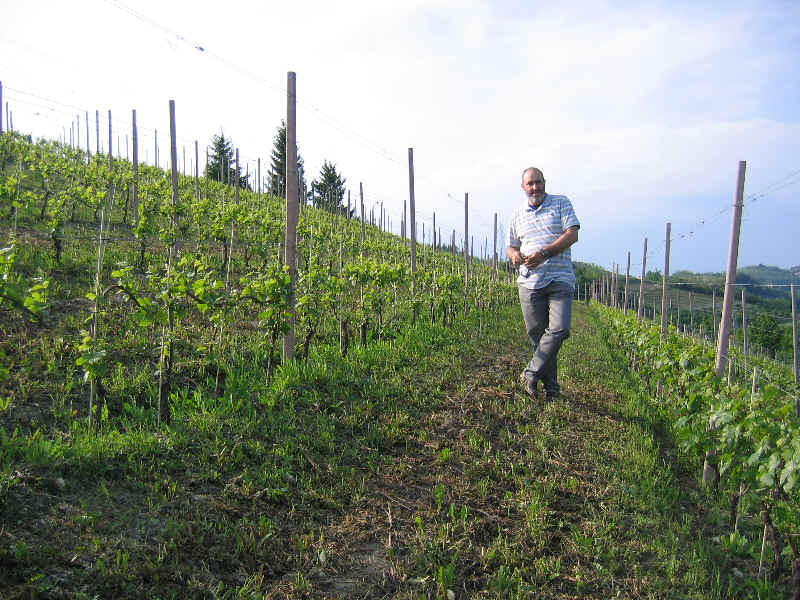 We know the Germano family as producing top notch Barolo and good Dolcetto, Barbera and such...even Riesling! 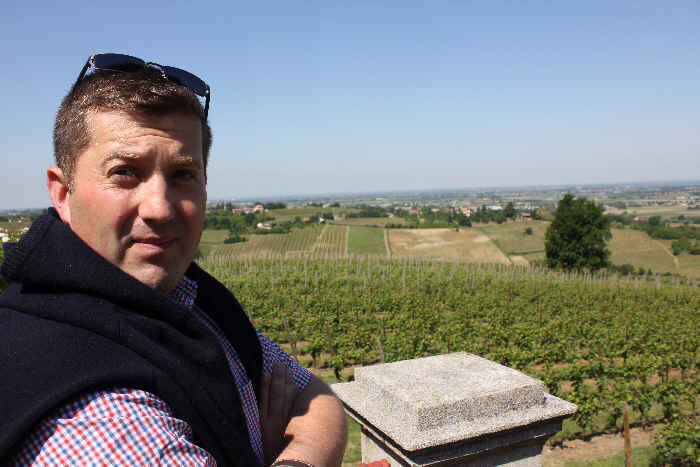 But winemaker Sergio Germano has an interest in wines from outside Piemonte as evidenced by his production of Chardonnay and Riesling. We have the 2007, a somewhat warm growing season. It's a medium-bodied and very dry bubbly...They've done a good job to retain crisp acidity, capture some yeasty notes and produce a lovely alternative to similarly-priced Champagne. We'd found the 2003 to be a bit bigger (hotter year) and vaguely reminiscent of old Krug Champagnes. The 2007 is more restrained and offers greater finesse. No, the fruit is not grown in Germano's backyard in the Serralunga area of Barolo. Germano, you see, has a vineyard site about a 30 minute drive from the winery in a town called Cigli�. On this chalky patch overlooking a small stream and valley below (should you fall off the hill), he grows Chardonnay, Riesling and Pinot Noir. The Chardonnay fraction is vinified in barrel (ha! 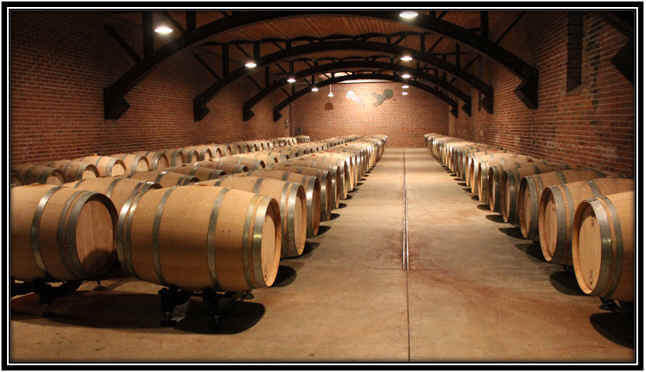 Krug is big on fermenting its base wines in wood), while the dominating Pinot Noir portion sees only stainless steel. The sweetening dosage is minimal, so the wine is rather dry. I think Sergio makes this primarily to drink with his lovely wife, Elena. We understand production is close to 2400 bottles annually, a few more than the couple can consume, so we're fortunate to have a few bottles to enjoy here in Burlingame! Sergio Germano out standing in Piemonte. Back in the 1980s we had a small company specializing in Italian wines. We imported some really nice wines (we thought they were nice, anyway, and other did and still do today...virtually every producer whose wine we brought it is bring imported into the US market today). And one of the wines we brought in was a wine we felt would find a receptive audience: Prosecco di Conegliano. Prosecco is the grape, of course. 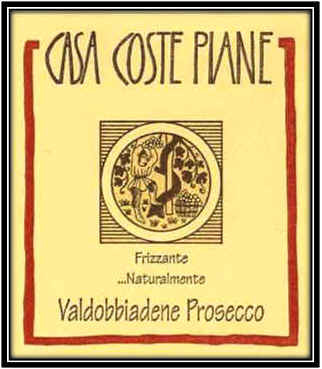 In those days, however, most wineries made Prosecco Frizzante (fizzy and bubbly, but not full-throttle effervescent in the format of Spumante). Our producer bottled his with a sort of 'mushroom' cork and so opening the bottle required a a wing-type corkscrew. 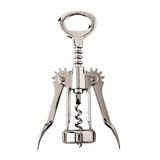 This would allow one to get sufficient leverage to remove the cork. A "waiter's" corkscrew might snap the neck off the bottle, since the cork had mushroomed out to fit the bottle and retain the carbon dioxide. And this proved to be a problem. Today, of course, Prosecco has become quite fashionable and it's extremely popular. In the late 1970s and early 1980s, Spanish Cava made its way into the US market. In the first decade of the 21st century, Prosecco made major inroads here, partly in the wake of big price hikes from Champagne producers and some California wineries. This left a void in the $10-$15 range for good sparkling wine and, ecco!, Prosecco. I can recommend this place as being worthy of a stop. CLICK HERE TO SEE SOME PHOTOS OF LUNCH AT GIGETTO. Closed Monday nights and Tuesdays. Livio Bronca worked in the Conegliano-area wine business for three decades and his two daughters, Antonella and Ersiliana grew up with wine as a major part of their lives. 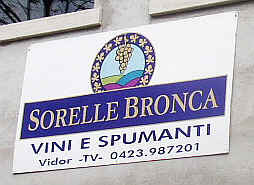 In the 1980s the Bronca sisters (or sorelle in Italian) decided they would embrace the wine business and so they started their own brand, Sorelle Bronca. We've been fans since their first bottling arrived in the Bay Area and the wine has continued to improve in quality, year after year. The Bronca sisters...Ersiliana and Antonella. Near the winery is a hillside vineyard called Particella 68. It's a beautiful vineyard and well-farmed. After hiking up and down the hill on a warm day, a sip of cool Prosecco is not a bad idea! Working with the two sisters is Antonella's husband, Piero. Ersiliana's daughter Elisa is now on board, having graduated from the wine school in Padova with a degree in enology. Heading the cellar crew is winemaker Federico Giotto. The winemaker is so accomplished, we understand there's a statue of him just outside the Uffizi. One of the innovations employed by this winery is they harvest their grapes and press the fruit, retaining the unfermented juice until they have an order for bubbly. At that time, they'll do a primary fermentation and immediately turn it into bubbly. This secret method allows the wine to retain more character of the Prosecco (or Glera, if you will) grape. 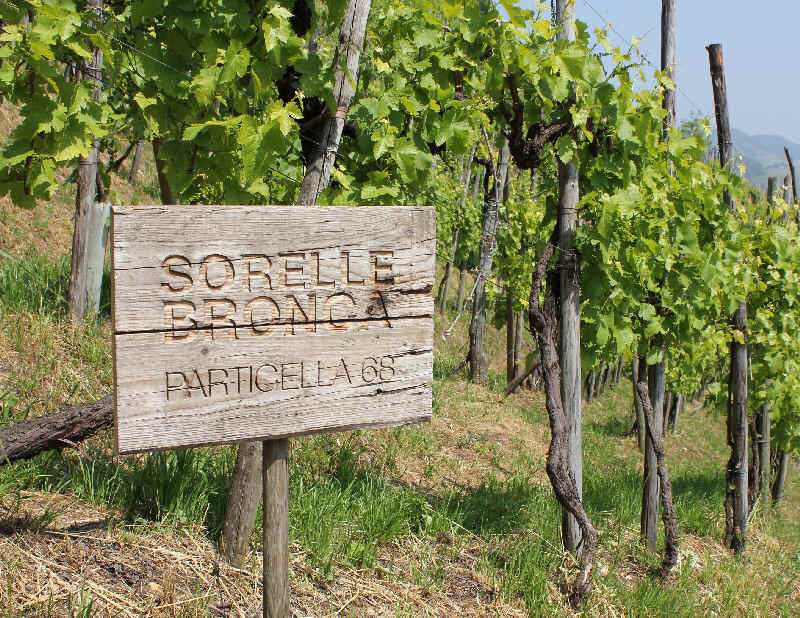 We like the blossom-like fragrance of Sorelle Bronca's Prosecco. It's very close to the Brut range of sparkling wines...just at the low end of the Extra Dry spectrum. 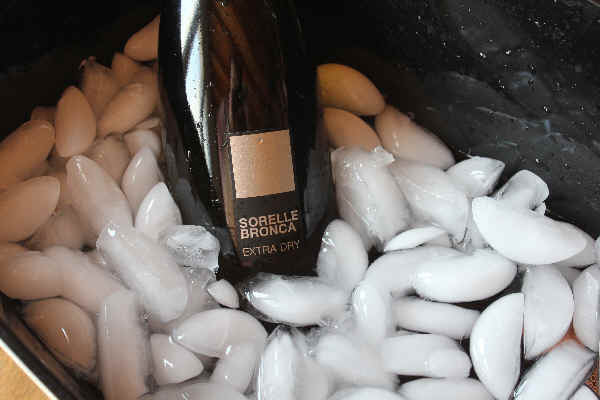 We offer the Sorelle Bronca Extra Dry Prosecco at a special price...presently $17.99 per bottle. It's a fine example of Prosecco. Finding the Drusian winery is not easy. 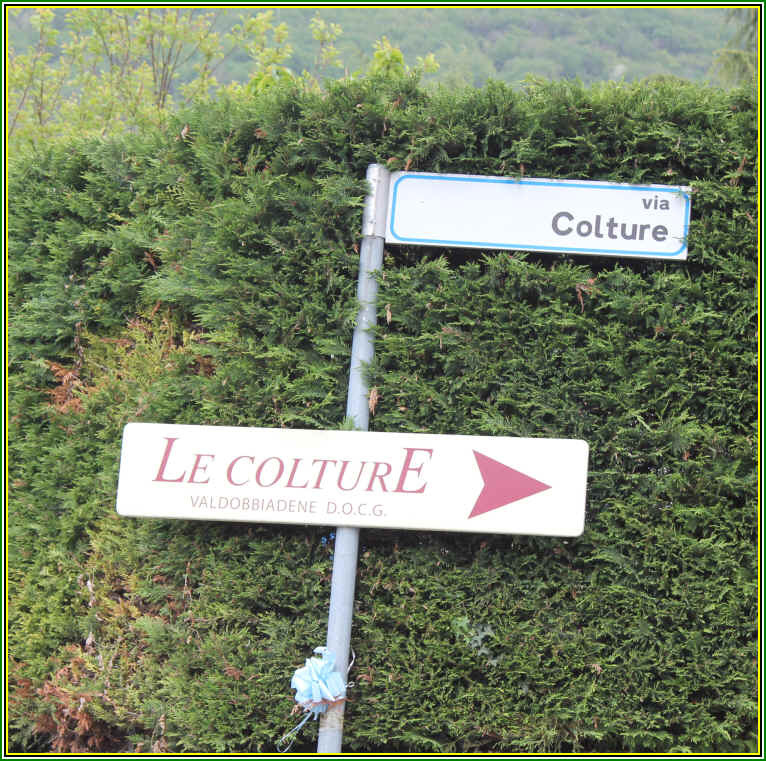 It's on the outskirts of the tiny town of Bigolino and you won't find a single sign helping you navigate your way to the winery. Even when you do locate the place, there's not a sign posted to indicate you've reached your destination. The Drusian family seems to prefer it that way, out of the spotlight, but making good wine. Grandpa Giuseppino started the place in the 1950s, we gather. His son Rino made wine until 1984 when his kid, Francesco, took over. Now Francesco is assisted by his daughter Marika. Francesco introduced some innovations. 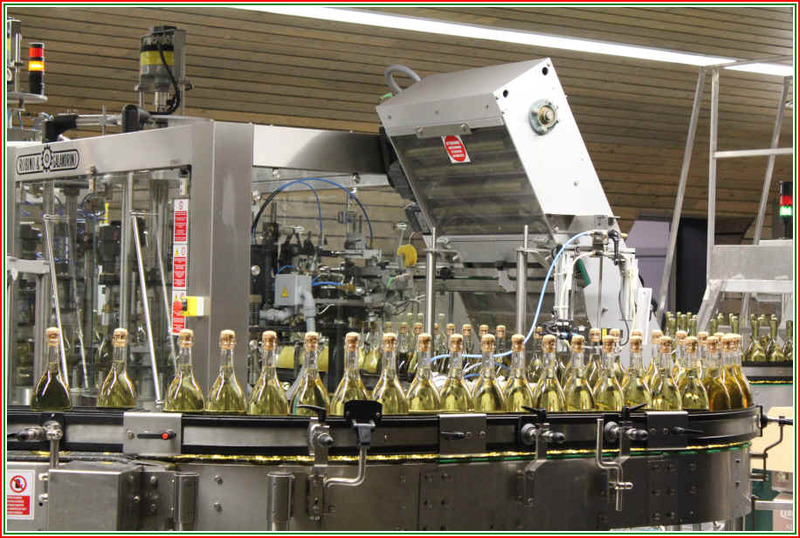 One was sparkling wine production. Previously they sold only table wine or "still wine" (non sparkling). In 1998 Francesco built a brand new winery and today they're a well-regarded producer of Prosecco. It's right in the middle of their 40 hectares of vines. The vineyards are farmed with care. It's said they farm organically. Francesco told us the current laws allow producers to blend in "other" wines and that many producers are a bit careless in their viticulture. As a result, apparently many producers buy Chardonnay or Pinot Bianco from Alto Adige wineries in bulk to enhance their base wines. Drusian does not. And his Extra Dry is drier than most Extra Dry sparklers. In fact, his Extra Dry is actually within the realm of what other producers label as "Brut." 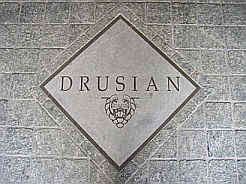 We have Drusian in both regular bottles and magnum formats. This is an old firm, founded back in 1860 by Antonio Carpen�. He was a fan of sparkling wines from France's Champagne region and dabbled in producing a similar product back home in Italy's Veneto. In fact, he was a leading light in producing sparkling wines in his day, surpassed by Giulio Ferrari several decades later. Here's an old 'ad' they came up with to show how their fine bubbly was made. The winery is still family-owned and they make boat-loads of wine and spirits. Prosecco is their claim to fame, but they also produce a blend of Prosecco and Chardonnay, hoping to cash in on the fame of the latter grape and the current fashion of the former. Carpen� Malvolti are certainly willing to experiment. They recently started production of a sparkling version of Petit Manseng, a grape more commonly found in the Juran�on region of southwest France. They're also currently making sparkling Viognier. We would carry this because a few customers have requested the Prosecco of Carpen� Malvolti, but we view the wines as perhaps having lost something due to the large scale of production of this company. It strikes us as relying a bit too much on its sweetness. Our friend Alberto Ruggeri makes this wine at the family estate in Santo Stefano di Valdobbiadene. The winery was founded in the 1980s and it's situated in a neighborhood with a few other cellars and surrounded by vineyards. The secret of this winery is that they have vineyard sites scattered around the appellation for Prosecco. They have 16 vineyard properties in Valdobbiadene, Conegliano and Montello. We can't say for sure that blending numerous vineyard sites together produces a superior bottle of Prosecco, but this winery does a good job in making a dry (Brut) bubbly with less than 12% alcohol and only a few grams of residual sugar. Pietro Tonon founded this little Venetian company in the 1930s and today it's run by his great grandson Loris Tonon. They seem to have several lines of wines, with this Villa Teresa level featuring all sorts of "negociant" bottlings and this rather nice little Prosecco. It's not a Prosecco from Conegliano Valdobbiadene...merely "Prosecco" from the Veneto. And it's stoppered with a ceramic closure which can easily be re-sealed. Bob was a big fan of Villa Teresa Prosecco and he seems to find it to be drier than Ellen or I. In any case, the wine seems to capture some of the ripe apple and blossom-like notes of Prosecco and it's modestly-priced. I caught the tail end of a seminar taught by a some Italian wine experts. These two fellers were giving a presentation on the wines of the Veneto region. They had a rigid tasting regimen and my BS Detector went off several times during the brief time I heard these guys sharing their expertise. In speaking about Prosecco, for example, they told the students (who paid a lot of cash for this indoctrination) that bottle fermented Prosecco didn't exist and really wasn't possible. The same guys, to illustrate the virtues of Soave, poured a French oak-aged bottling as the poster child for that denominazione. Really? Only a tiny percentage of wine bearing the name Soave sees wood, unless you count the cardboard box in which the bottles are shipped. Our colleague Bob Gorman tasted this wine for the first time recently and remarked "Hey! This is Prosecco all grown up!" And you know, he's right. 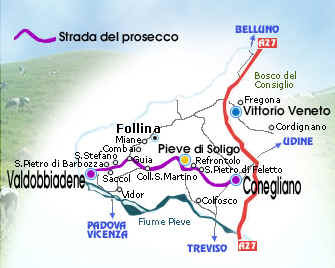 Starting from the vineyards, though: Most Prosecco comes from flat-land sites. The family of Loris Follador planted Prosecco vineyards on hillsides because, well, that was the land they owned. And the terrain is limestone or sandstone...you couldn't really grow much else there. It took them until 1983 to begin bottling their own wines. Prior to that, everything was sold in bulk. And it remains a relatively small winery. They have about 6 hectares of vineyards and these vines are old and well-established. This means it's fairly easy to cultivate without herbicides, pesticides and fertilizers. And the wine is made by fermenting it in the bottle, not in some giant, Charmat process wine tank. It's classified as a Vino Frizzante, so it's a tad less bubbly than full-throttle Spumante. 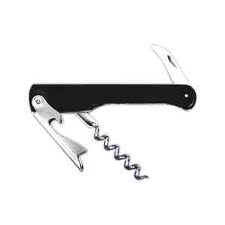 And it requires a corkscrew (a butterfly or wing-type corkscrew works best) that's used with care. Since this is not disgorged, it does have a tiny bit of sediment. And it's "alive" and developing in bottle as it ages, so each bottle is a tad different from the next. The wine is very dry and nicely crisp. It's much less fruity than normal Prosecco. And we like it very much. You've probably heard of the sparkling wines of the Roederer firm. This is not made by that family. 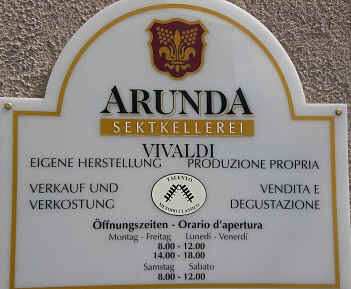 And they own the Arunda winery and produce wines under the Arunda label or the Vivaldi brand for the Italian market. Arunda is the name of a nearby mountain. The Reiterer's winery is in an alpine village called Meltina. It's located at too high an elevation for them to have vineyards in the neighborhood, so they buy grapes from other towns such as Cornaiano, Terlano and Appiano. Chardonnay, Pinot Noir and Pinot Bianco are brought in to make the Arunda bubblies. The firm is fairly young. They began in 1979 and have become fairly well-regarded for their bubblies. But they are a small family enterprise and it's known more to serious wine geeks than to the average bear. 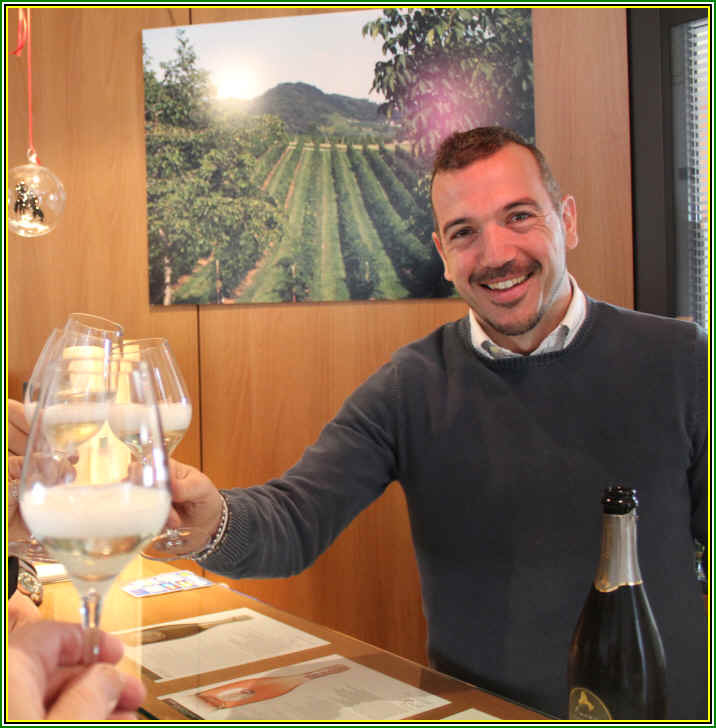 Josef/Giuseppe/Joseph Reiterer produces what most connoisseurs consider to be the reference point for Alto Adige spumante. The Brut is about half Chardonnay with 30% Pinot Bianco and the rest of the cuvee accounted for by Pinot Nero. It's fermented in bottle and left for 2 years to mature on the spent yeast. We were first introduced to the Arunda bubbly by our friends Gaby & Norbert in Frankfurt. As frequent visitors to the Alto Adige region for hiking, they've made the rounds of the top wineries. Gaby's a bit of a sparkling wine aficionado (she has a weakness for Krug) and she'll tell you the Arunda is the best of the region. The Bisson name is well-regarded in Italy as it's that of a famous wine shop in Liguria. The work of Pierluigi Lugano, the store opened in 1978 and not only sells Italian wines, but Lugano makes some wines from nearby vineyards in Liguria (near Genoa). 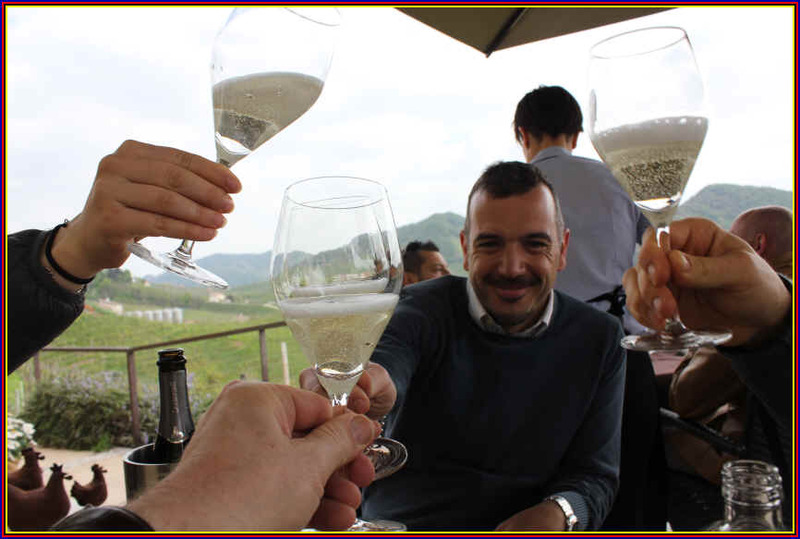 A friend has a vineyard of Glera (or Prosecco) in Italy's Veneto and Lugano had an idea in mind for producing good sparkling wine but with a result that would be a shade different from the Prosecco bottlings already on the market. But Lugano wanted a dry bubbly and they did a brilliant job with this. It's sealed with a 'crown cap,' so a "church key" bottle opener will do the trick. The wine has that lovely fresh, white flower fragrance of the Glera/Prosecco grape. It's also a shade less fizzy than typical 'spumante,' having slightly less pressure in the bottle. Lombardia is home of the famous Franciacorta wine, a Champagne-like sparkling wine which is often of better-than-average quality. There's also the Valtellina, a region bordering Switzerland where Nebbiolo does well. Then there's the Oltrep� Pavese region...a rather large area and yet relatively unknown much outside its borders. There's a considerable planting of Pinot Nero in the region and it's long been a source of sparkling wine based on that grape. 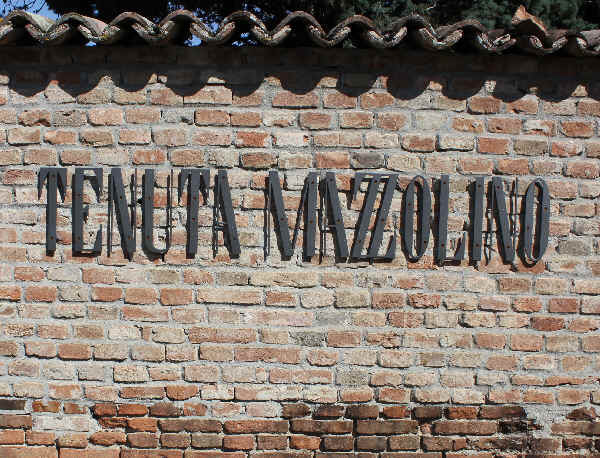 The Mazzolino estate has been run by the Braggiotti family since the 1980s. It was one of the first wineries in the region to distance itself from the crowd by making good wines. With all that Pinot Nero planted in the region, owner Sandra Braggiotti brought in a winemaker from France, a place where they know a thing or two about Pinot. The wine we have is made of Chardonnay, though, and spends about 18 months on the yeast, enough to become quite bubbly, but still retaining a nicely appley character. It's dry, light and crisp on the palate...very fine and price-worthy, too. The winery sits atop that knoll in the distance. They also make a highly-regarded Pinot Noir. Not many half-bottles of Prosecco are available in our market, but the Ruggeri is nice when you want just a couple of glasses and a full bottle is too much. This is a delightful little bubbly, capturing the acacia blossom and ripe apple fruit of the Prosecco grape.